Even a tiny pug can have a BIG dream! I would give this book 10 out of 10 because I really enjoyed it, and am gong to read it all over again! My favourite character was pugly because he is very funny and he try’s to help the other contestants on the the ice stay in the competition. I also liked clam because she was helping pugly on the ice. I also liked their double act because it was very funny. I do recommend this book to others because the book is very humorous and I really like it! I liked Pugly the main character best because he is cute and a funny dog. He likes ice skating and I like it too. 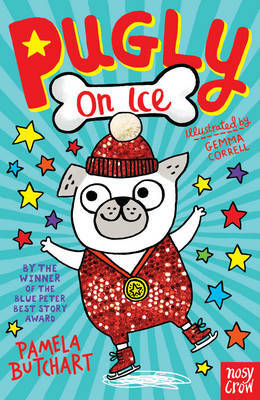 i think others should read this book because pugly won a compotition because he stops some naughty dogs. I recommend this book because the main character is really funny and his friend clem helps the main character when he needs help with something and in the book they do a little partnership and if you like comedy I recommend this book. I liked this book because the main character is really funny and he has a friend called clem and she helps the main character pugly when he doesn't understand. I like how the Pomeranian was Spanish, and how the greyhound is EVIL and They won Unlimited Treats!!! This is a great book, I recommend this book for challenging readers and Dog Lovers, especially if you have a sausage dog, Pomeranian, a Greyhound and a Tiny Dog! Maybe even a Cat! This was my favourite book so far. I really enjoyed the part when pugly and clem where skating together on the ice. I think Pugly on ice was very good because it had investigating and that is my thing.